The theme of the Tunisia Pavilion is "Tunisia: Peace and Sustainable Development." Economic development should not damage the present environment. 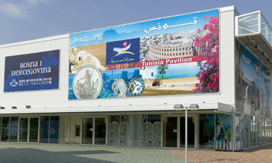 The pavilion introduces in various exhibited materials how Tunisia is protecting and managing water and other natural resources, conserving biodiversity through the development of national parks and nature reserves, and popularizing environmental education. Of course, you cannot miss the introduction of Tunisian history 3,000 years long and its national land. Please also learn about the influence given by various historical stages to Tunisia - the Carthaginian, Roman, Arabian and Ottoman Turkish periods, and see the deserts, the Mediterranean Sea, oases, and rich greenery of olive and pine trees on the beach. Why don't you refresh yourselves by drinking mint tea and coffee particular to northern Africa and eating delicious cakes? At the pavilion, traditional handicrafts, ceramics, mosaic works known since the Carthage period and other souvenirs are sold.